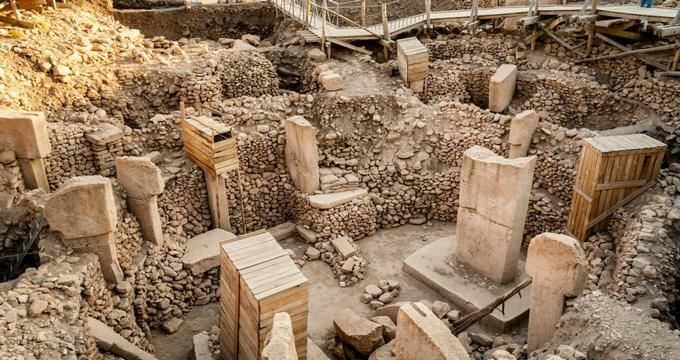 The archaeological site of Gobekli Tepe sits on top of a mountain ridge in modern-day Turkey. The site is located about six miles from the ancient city of Urfa, in the southeastern region of the country. The height of the tell is 49 feet, and has a diameter of 980 feet. It's possible that the site is the world's first temple. It predates Stonehenge by 6,000 years and turns the conventional view of the rise of civilization upside down. Dating back to the tenth to eighth millennium BCE, it includes two phases of ritual use. The oldest known megaliths in the world were erected during the first phase, pre-pottery Neolithic A. These megaliths are circles of enormous T-shaped stone pillars. About twenty circles consisting of over two hundred pillars are presently known from geophysical surveys. Each circle has a somewhat similar layout with two large T-shaped stone pillars in the center that are encircled by smaller, inward facing stones. Each of these pillars weighs up to twenty tons, and is up to twenty feet in height. The pillars are situated in sockets that were cut out of the bedrock. These huge carved stones are around 11,000 years old and were crafted by people who had not even developed pottery or metal tools. Some of these stones have elaborately carved animals on them, such as vultures, scorpions, lions, and foxes. Other stones are completely blank. In Pre-Pottery Neolithic B, the second phase, smaller pillars were erected. These pillars were placed in rectangular rooms that also featured floors of polished lime. After the Pre-Pottery Neolithic B period, the site was abandoned. Younger structures date back to the classical era. Detailed information about the function of the structure still remains a mystery. Gobekli Tepe was excavated by a team lead by German archaeologist Klaus Schmidt from 1996 until 2014 upon Schmidt' death. He thought that these sites were sanctuaries from early neolithic times, not used as a settlement, but rather as a holy site. The site of Gobekli Tepe is situated at the Fertile Crescent's northern edge. This arc of arable land and mild climate stretches from the Persian Gulf to what is now Egypt, Jordan, Israel, and Lebanon. The land and climate would have drawn hunter-gathers to the area from the Levant and Africa. Schmidt believed the site was civilization's first "cathedral on a hill" partly due to finding no evidence that people resided permanently on the Gobekli Tepe's summit itself. He stated once that archaeologists could excavate the site for another fifty years and still just barely scratch the surface. This archaeological site was first examined, and then dismissed, by anthropologists from Istanbul University and University of Chicago in the 1960's. After seeing some broken limestone slabs on the hill, they assumed it was just an abandoned medieval cemetery. Schmidt was working on a survey of the region's prehistoric sites in 1994, and decided to take a look at the site himself after reading a mention of it in the researcher's report from the University of Chicago.